For me, Year 2015 started on a RED note...Literally !! L’Oréal Paris launched the Color Riche Collection Star range. The New L’Oreal Pure Red Lipsticks are 7 different tones of red lip colors chosen by 7 ionic L’Oréal Paris ambassadors. The L'Oreal Paris Color Riche Pure Reds Collection is created with a revolutionary and innovative formula that delivers bold, luscious color that lasts for a full 6 hours, making it the ultimate beauty indulgence. Pure pigments deliver intense color and Jojoba oil gives perfect hydration up to 4 hours. The range includes 7 exquisite matte shades. A rouge for every woman. Discover a shade of red that is as unique as you are! These are similar to L’Oreal Moist Matte Lipsticks and come in classy black lipstick casing which is signed by the shade’s ambassador. The texture of the lipsticks are smooth and stains are rich. 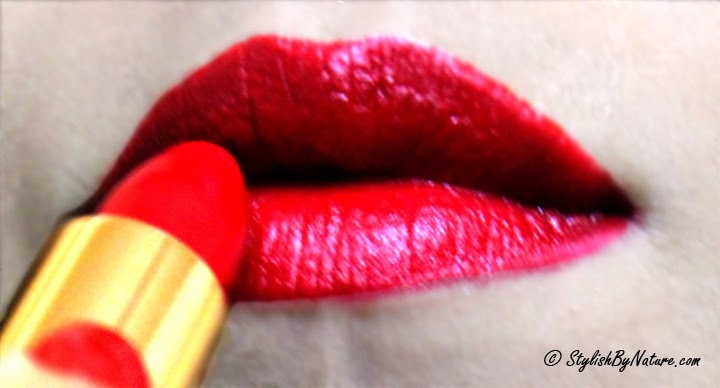 I love the way it glides on my lips and provides a rich stain. Such a matte, velvety finish just with two swipes. Even my camera loves to capture me with Loreal Lips. Excellent. The lipstick stay without loss of stain or retouch for a good period of 8 hours. Eat, drink and be merry without fear of spoiling your lipstick. FREEDOM...YAY !! I love the variety of shades included in Collection Star Red Lipsticks. Every bride should own the 7 colors and stay sorted for any occasion. From pinks to corals to right shades of RED, these 7 shades are life saver in every possible way !! Lemme know which shade you like the most ? ?